The J4E series utilizes formed steel legs and steel channel vs. heavier duty tube steel. 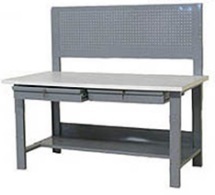 When top aesthetics aren’t a priority, this more industrial looking bench delivers solid quality at a much lower price, backed by a strong warranty. Leg inserts for height adjustment included! Phenolic resin: Anti-microbial, chemical & temp resistant, for science uses in bio/pharma, chemical labs, etc. Maple butcherblock. 1.75” solid hardwood. Takes abuse, can be refinished. 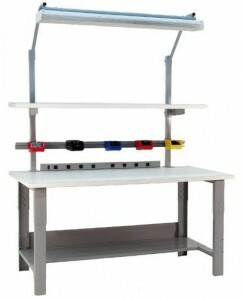 Often used in industrial and other heavy duty workspace. Need something extra or different? We like to accommodate. 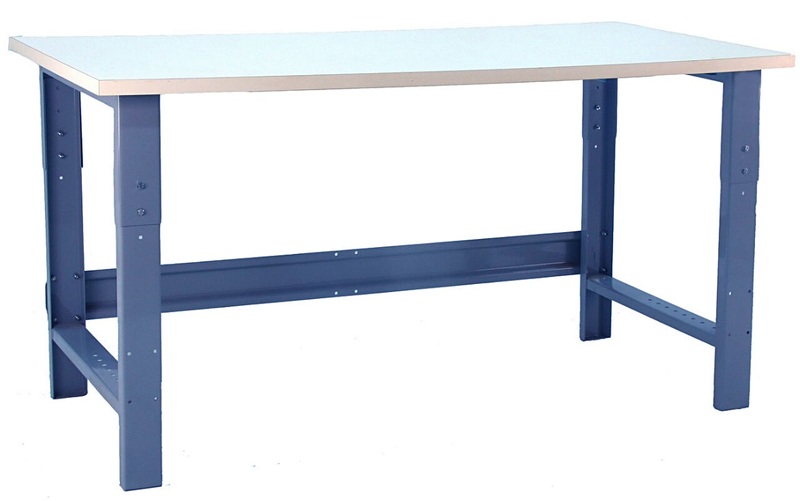 The #J4E ‘starting point’: Steel frame with rear brace and a worksurface. Specify size & worksurface material. Add available accessories & options as needed.